A few months ago I was on a conference telephone call with colleagues for a research project I am working on. The team is dispersed. Linda lives in Scotland, other members of the team are based around Birmingham, across Devon and Lancashire and I am in London. Conference calling is a good way of keeping a research team together. Linda mentioned she was coming down to London to do a photo shoot for her book. The Times were planning a feature piece for September. I was intrigued – what’s the book about? It is about the story of Linda Gask – psychiatrist, academic and person living with depression. “The Other Side of Silence” is compelling reading – well I think so! It is both a memoir and a book to educate others about what it feels like to live with depression. Linda sent me an early copy and I dipped into the chapters – on “fear”, “loss”, “love” , “grief” and “loneliness”. It is really well written. I mean that – I found it engaging, thought provoking and so interesting for ‘telling it how it is’. The text is broken with reflections from seeing patients over the years (some detailed changed of course) or details about her own treatment and state of mind in the past. It is, however, mostly prose outlining very personal reflections on her life exploring many emotions and explanations for why she felt the way she did and coping strategies she found along the way. The message is clear: “I’ve survived and come through it, and I know others can too”. I really did feel like I was getting to know Linda which was very odd because up until that point all I knew of her was her eminent reputation as an academic, and a glimpse of the person through being in meetings together. I knew she was straight talking and intelligent, decisive, hugely experienced in delivering large scale research studies and developing new ways of doing things in mental health care, was personable, friendly, loved cats and I had a sense always wore mainly black clothes. As I started reading ‘The Other Side of Silence’ I had a feeling that clothing choices were going to become particularly relevant. What I was to learn and you will also if you read the ‘The Other Side of Silence,’ is how it felt to pass through ordinary stages of life through a lens of living with depression – and why. Leaving home, getting married, changing jobs, death of a parent, establishing and ending significant relationships. A key theme in the book is Linda’s fear of failing – her exams, being the doctor her patients need, and as a daughter, sister and wife. Depression and anxiety envelop her through every life stage, and looking back she tries to explain why. I hope that this book feels like a massive achievement. Being able to read about a person I very vaguely “know” through a beautifully crafted book that really does humanise what it is to live with a mental illness, was a privilege. I am not sure what I will say to Linda when I next see her – I think a hug is probably the first part of the communication. 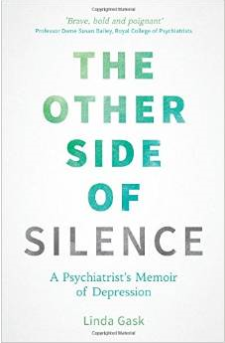 I really feel books like ‘The Other Side of Silence’ help demystify mental health. When I was doing my PhD research, I befriended a person to ‘give back’ into a community I was studying and to understand psychosis better through having a relationship with someone who could tell me far more than reading research papers. The second best thing was reading autobiographical books. I always recommend such books to new staff as a “way in” to understanding mental health and mental illness. We now have another book on the shelf to help us open up conversations about “madness”.